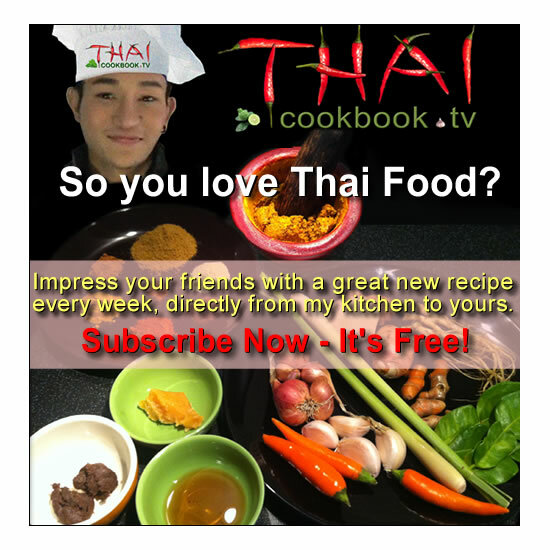 This delicious Thai stir fry makes a wonderful lunch when served with some piping hot steamed rice, or serve it as a main dish with other foods for a complete meal. This recipe combines our beautiful bright green eggplant, the one called Makua Yao, with lean ground pork, sweet basil, mild chilies, and pea eggplants. It is quite simple to make, and you can easily substitute ground beef or chicken if you do not eat pork for an equally satisfying dish. What's in our Stir-fried Eggplant with Chopped Pork. 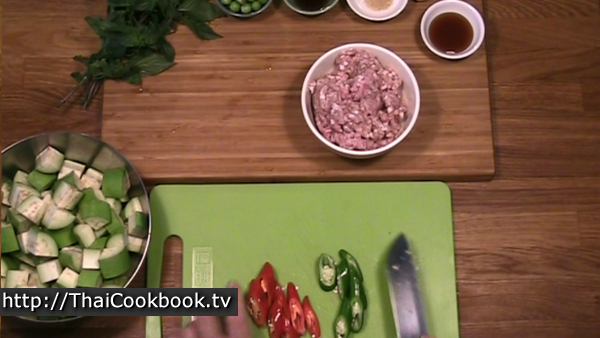 How we make our Stir-fried Eggplant with Chopped Pork. 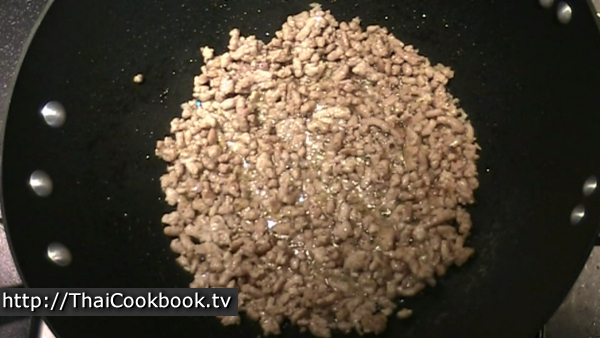 1) Fry garlic until fragrant, then add the ground meat. Fry until well browned. 2) Add the sauces and sugar, continue frying until caramelized, then add a small amount of water. 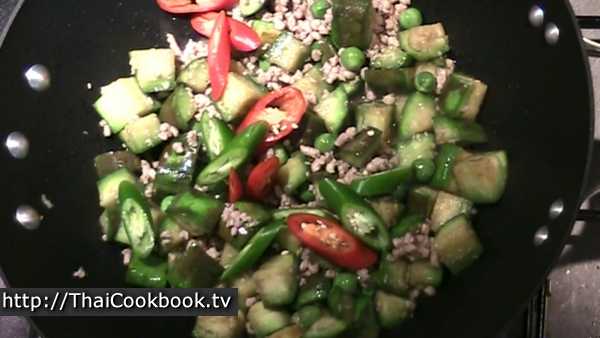 4) Add the chili and pea eggplants. Continue cooking for another minute. Turn off the heat and toss in the basil. Serve immediately. 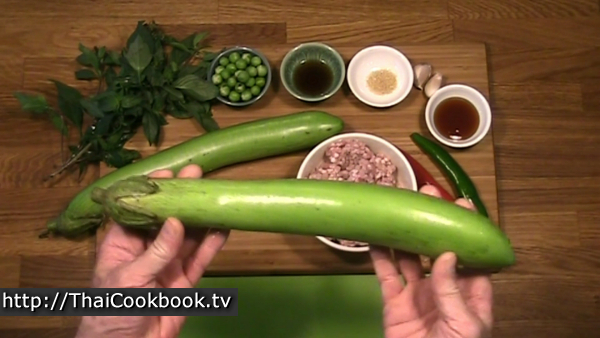 In Thailand we generally use the long green eggplant for this dish, but you can use other types, such as the purple Japanese eggplant, and the dish will still come out great. 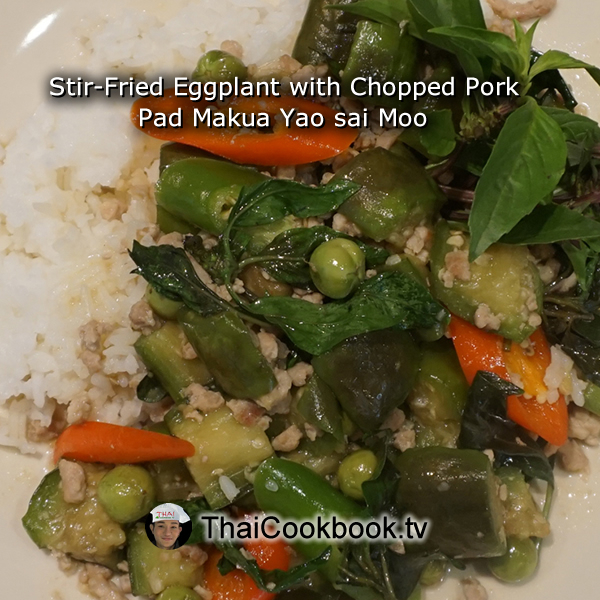 The small pea eggplants are added near the end and cooked just a little so they stay crunchy and add great texture to the dish. If you do not have access to pea eggplants you can leave them out. We cut the eggplant into 1 inch slices, then quarter each slice so it is in nice bite sized pieces. How you cut your eggplant will depend on the type you use, so just cut it into 1 inch cubes if you are using big eggplants. Put the cut eggplant into a bowl of salted water to keep them from turning brown while you get the rest of the ingredients ready. Pluck the stems and hulls from the pea eggplants, slice chilies on a diagonal, and chop the garlic very fine. 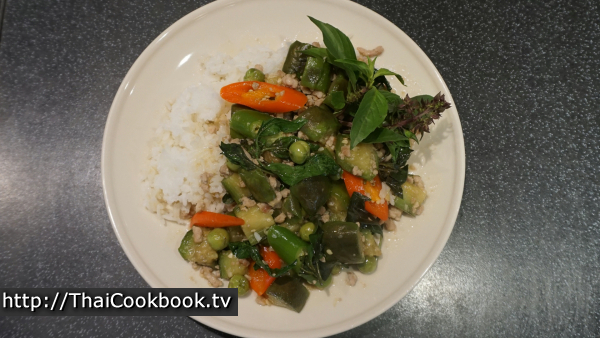 Pluck the leaves and flower tops from the Thai sweet basil. We are using the type of basil that we call Horapah, which has a strong flavor of licorice or anise. This give the dish a very distinct flavor, so be sure you have the right type. Fry the garlic in oil over low heat for a few seconds. 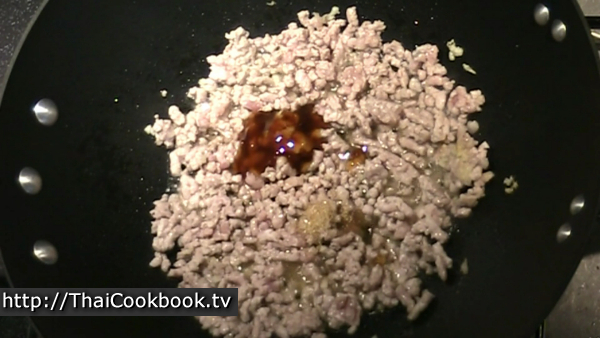 Add the ground meat (pork, beef, or chicken), turn the heat up high, and fry it until well browned. Add the sauces and sugar, stir it in well, and continue frying until the thick and sticky. Fry the meat until edges of the pan are dry and looking like it's burning, then add a tablespoon of water. 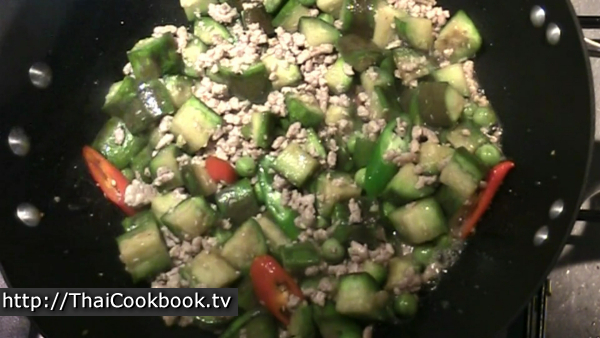 Stir it in well to deglaze the pan and develop a nice sauce in the meat. 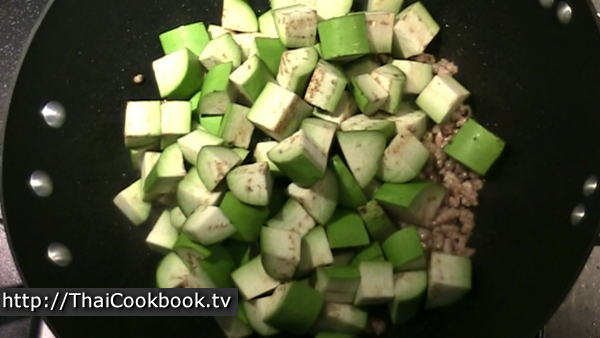 Add the cut green eggplant, stir it in well and reduce the heat to medium. 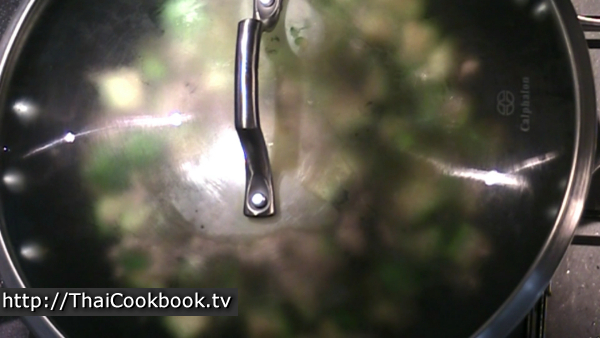 Cover with a lid and cook for about 5 minutes, stirring it up every so often. 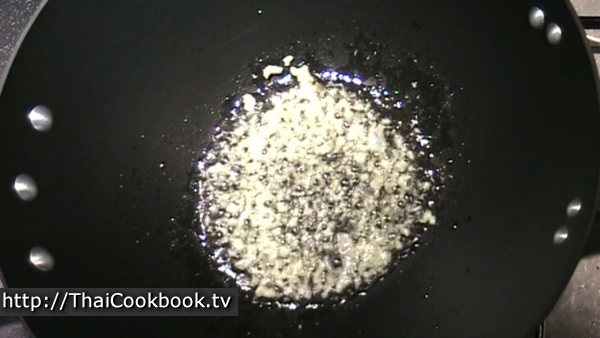 Add just a little water to the pan as need to maintain a little sauce. 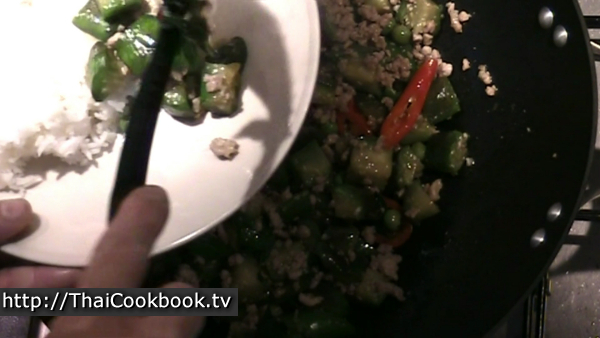 Add the cut chilies ad pea eggplants, stir them in well, cover and cook for about a minute. Now the chilies and pea eggplants are just barely cooked. Turn off the heat. 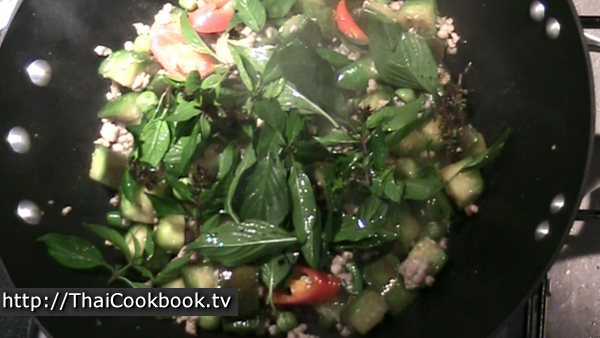 Add the basil and stir it in lightly, letting it wilt in the residual heat of the pan. 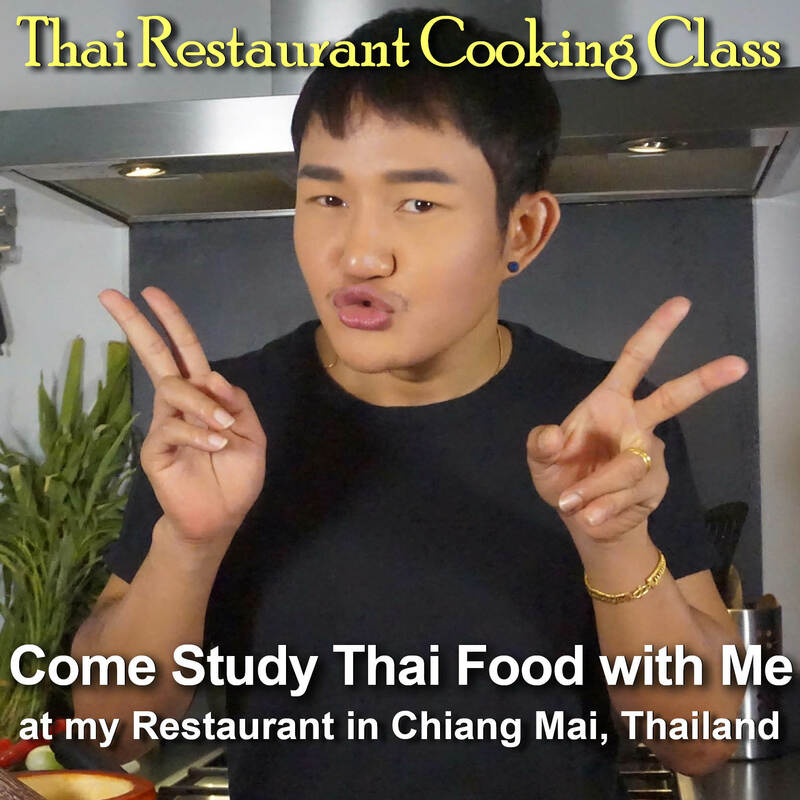 Serve each portion on a small plate with some steamed rice for a delicious one dish meal, or on a plate to be served at the tables as part of a complete meal with other foods. 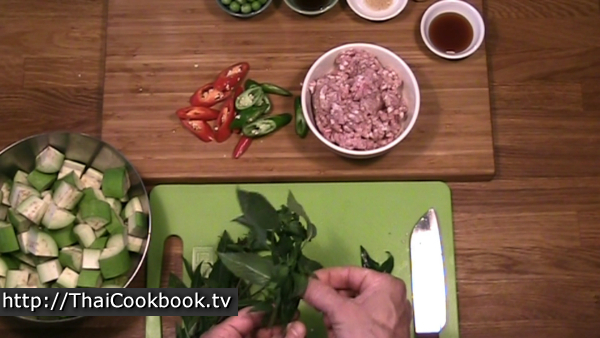 Arrange the ingredients so they look delicious, and garnish with some fresh basil tops.